A new reason to love Wednesdays!! To most people, Wednesday’s simply mean hump day. The day that puts you further away from Monday and closer to the weekend. Here, at Deep Creek Lake, Wednesday’s actually signifies more than that. It signifies an evening of casual yet elegant ambience. A night to indulge with a large selection of delectable, gourmet cuisine . A night to create a feast to your specific desires without the painstaking work of actually preparing it. Yes, that’s right, folks. We are talking about Pasta Mania night at The Four Seasons Restaurant. If you have never dined at the Four Seasons, I strongly recommend that you check it out. The restaurant itself is fashioned in elegant décor with votive candles accenting the tables. Offering some of the finest lakefront dining in the area, guests can enjoy their meal while taking in the exquisite lake and mountain views. Their menu consists of everything from steak and seafood to yummy appetizers such as calamari and Thai scallops. 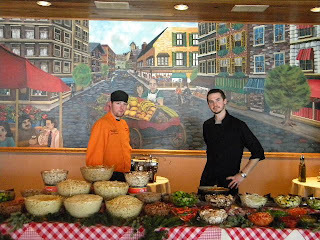 On Pasta Mania night, they set up a large buffet style station where guests get to choose their own pasta meal. By choose, I mean they offer a variety of different noodles, sauces, and toppings (lots of fresh veggies included). Taylor-Made Deep Creek Vacations employees and employers ventured out for a night on the town last Wednesday to check out the selection and I must say, we have nothing but positive things to say. The food was absolutely divine; the customer service stellar, and a great time was had by all. In the meantime, slopes are open, the sun is shining, and it is a great time to call for some fabulous last minute deals on your perfect vacation home. In the meantime, we can’t wait to see you at the lake! Next Next post: A Look Back….